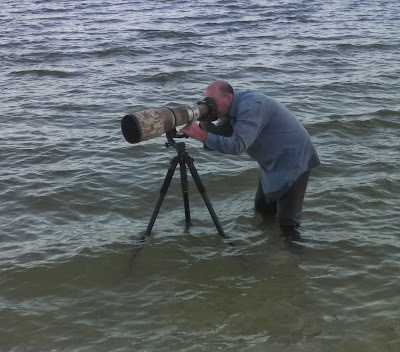 We recently have been fortunate to have Master Birder Vince McGrath locate both a Nelson's and a Saltmarsh Sparrow in a location adjacent to Bunche Beach Preserve, called the Salt Flats. 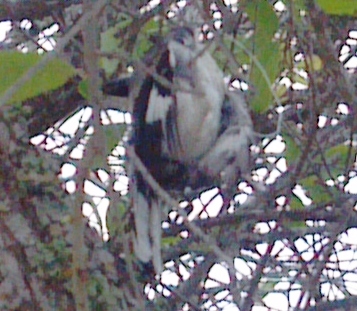 I was lucky to be with him on an occasion to relocate these birds. Both Lifers for me and very unusual to see in Lee County. 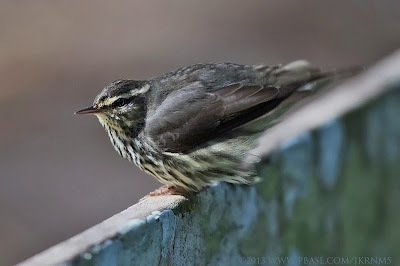 Dr Jose Padilla has provided this photo he recently took of the Saltmarsh Sparrow. Saltmarsh Sparrow at Bunche Beach Salt Flats. Yesterday I headed up to Desoto County to chase after a reported Say's Phoebe. This is a very rare bird to find in Florida and is drawing a late of interest. 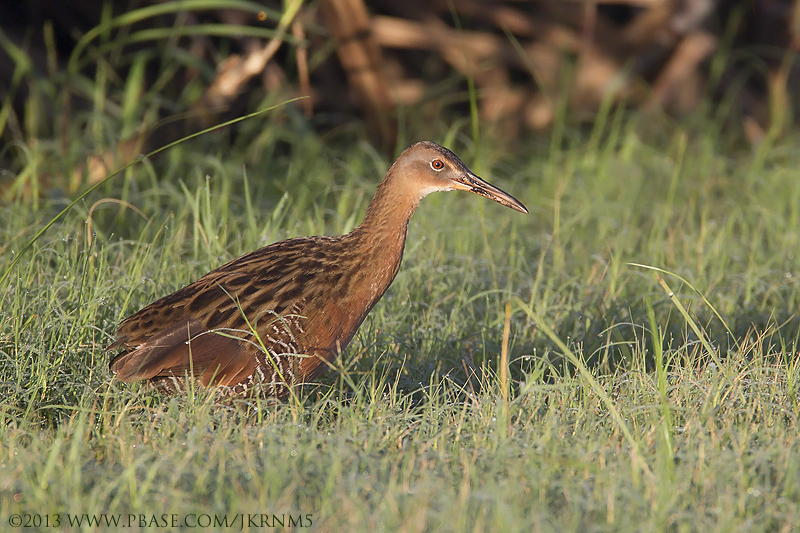 It is among several Western birds that have shown up in the Sunshine State this fall. A Sulpher-bellied Flycatcher made a very brief stop in Naples two weeks age. A second record in Florida of a Townsend's Solitaire showed up at Honeymoon State Park for several days before disappearing. At the same time a Varied Thrush was seen and photographed in Pinellas County for just one day. Say's Phoebe seen on Four Mile Grade. Photo courtesy of Dr Jose Padilla who saw the phoebe on the 11th. 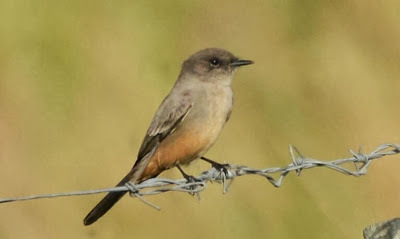 The Say's Phoebe (281) was found at a pole barn location on four Mile Grade a few miles east of Arcadia in Desoto County. Arcadia has a very interesting history. Back in the late Nineteenth Century is was a rough Cow Town, who's cowboys could rival any from the West in skill and character. It was a productive venue, but I did draw the attention of a local. Was questioned on what I was doing. He offered concerns about strangers hanging around as they had experience some recent theft. So its best to respect the No Trespassing signs and stay on the road. Today I rose early to chase after a reported Surf Scoter. 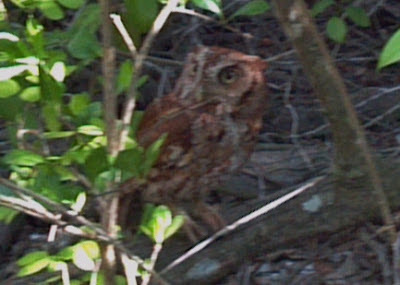 Spent an hour at the Bayshore Live Oak Park along the Peace River in Port Charlotte looking for the bird. No doubt it was present in a large raft of birds floating in the middle of the river. lacking a scope, the best I could distinguish were a few Black Scoters. Later in the day I read a report that another birder noted the surf scoter was mixed in with some American Widgeons. Plus a great many lesser scaups and black scoters. Other birds I did see included Least Sandpipers, Semipalmated Plovers, a Spotted Sandpiper, Dunlin, White Ibis, Cormorants, Laughing Gulls, Sandwich Terns, Royal Terns and a Forster's Tern. As it was very close I elected to add a stop at Ollie's Pond Park on Avon St. Lots of Yellow-rumped Warblers and Eastern Phoebe. The pond held many Common Gallinules, Pied-billed Grebes and Blue-winged Teal. Also present were Lesser Scaups, Hooded Mergansers, Mottled ducks, a Northern Shoveler, a Green-winged Teal and an American Widgeon. Also had a Cooper's Hawk pass over head. Need to head back to the Peace River soon but with someone who owns a scope. The local bird population is now reflecting our typical winter mix of species. The House Wrens and Yellow-bellied Sapsuckers have arrived. Along with Gray Catbirds, Northern Harriers, Eastern Phoebe, Blue-headed Vireo, Wilson's Snipe, American Kestrels and notably large numbers of Palm and Yellow-rumped Warblers. The American White Pelicans and Dunlins have arrived on the shore along with all the expected shorebirds. Common Loons and Red-breasted Mergansers will arrive in a few more weeks. Bald eagles and Ospreys will be nesting soon and our winter ducks and sparrows will be along soon as well. So with the arrival of cooler days we are seeing the end of the neo-tropic fall bird migration and we can reflect on what we encountered in our corner of Florida for October. We did have some very good days. Over all it wasn't great, but we did have some samplings of the neo-tropical birds heading south. we did have a few larger than usual sightings of on Golden-winged Warblers ( a nemesis bird for me ), Nashville Warblers and Swanson's Warblers. Probably the most commonly seen warblers seen here were Ovenbirds, Common Yellowthroats, Northern Waterthrush, Worm-eating Warbler, American Redstart, Black-and-White Warble, Yellow-throated Warbler, Northern Parula and Black-throated Green Warbler. 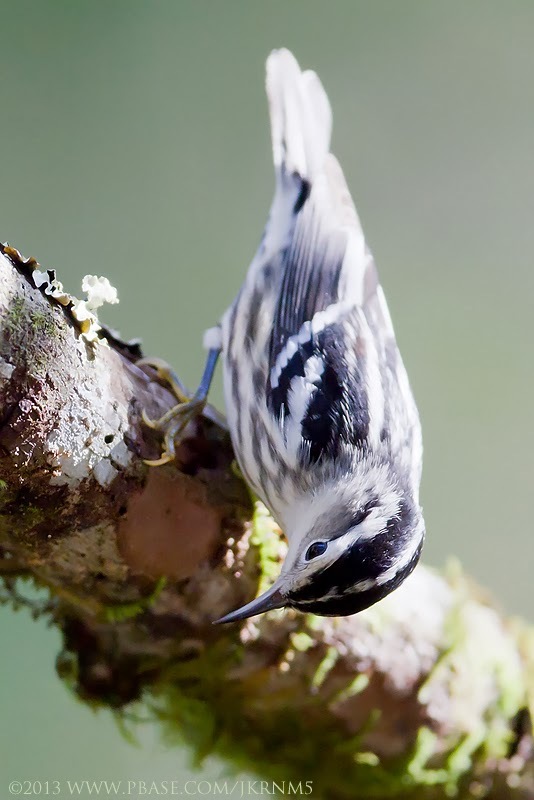 we also had samplings of Bay-breasted warbler, Blackburnian Warbler, Black-throated Blue Warbler, Tennessee Warbler, Magnolia Warbler, Yellow Warbler, Chestnut-sided Warbler, Blue-winged warbler ( rare this season ), and Hooded Warbler ( also rare this season). Eastern Kingbirds were passing through and a Western Kingbird and a Scissor-tailed Flycatcher were seen at the Sanibel Lighthouse. Other samplings of neo-tropical passing through included Eastern Wood-Peewee, Bobolinks, Acadian Flycatcher, Yellow-throated Vireo, Red-eyed Vireo, a Philadelphia Vireo (seen on Sanibel), Blue Grosbeak, Rose-breasted Grosbeak, Summer Tanager, Scarlet Tanager, Baltimore Oriole, Broad-winged Hawk, Peregrine Falcon, Merlin, Barn swallows, Cliff Swallows and Swanson's Thrush. Short-tailed Hawks have become more numerous and can be often found soaring over Six-Mile Cypress Slough Preserve. Swallows have thinned out, but it won't be long till thousands of Tree Swallows return to entertain us with their swirling flocks moving about as a living tornado of birds. As for sparrows we mostly see Savannah, with a few Grasshopper, Chipping and Swamp Sparrows. Just this past Monday I was fortunate to observe, near Bunche Beach, Nelson's (279) and a Saltmarsh Sparrow (280) located by local Master birder Vince McGrath. These were Lifers for me and very rare to our area. Thanks Vince. The quality and quantity of the Fall Migration action is very weather dependent in our corner of Florida. And the winds and weather fronts have been very favorable for the birds to make their dash to the tropics. With the conclusion of September, I would have to say that migration here has been so-so. Still have a few more weeks to go and we should have some good opportunities yet. I have spent many hours birding one of our local hot spots - Six-Mile Cypress Slough Preserve - this past month. Probably walked twenty-five miles on the boardwalk listening for Tufted Titmice, because our best results for seasonal migrants were in finding mixed flocks of warblers, gnatcatchers and titmice. 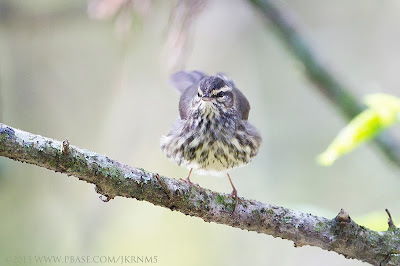 Right now Six-mile Cypress Slough has been featuring Ovenbirds, Northern Waterthrushes, Black-and-White Warblers, Yellow-Throated Warblers, Common Yellow-Throats, Prairie Warblers, Northern Parula,, Palm Warblers (just arriving), and American Redstarts. Other migrants seen sporadically include Swanson's Warbler, Golden-winged Warbler, Blue-winged Warbler, Worm-eating Warbler, Prothonotary Warbler, Yellow Warbler, Blackburnian Warbler, Chestnut-sided Warbler, Black-throated Green Warbler, Black-throated Blue Warbler, Magnolia Warbler, Louisiana Waterthrush, Tennessee Warbler, Veery, Gray-cheeked Thrush, Swanson's Thrush, Eastern Wood-Pewee, Acadian Flycatcher, Summer Tanager, Yellow-billed Cuckoo and Red-eyed Vireo. Missing so far as I know have been any sightings of Hooded Warblers, Kentucky Warbler or Yellow-Throated Vireos. Short-tailed Hawks have returned and have been seen regularly soaring above the preserve. A lot of variety here but numbers have been very low so far. 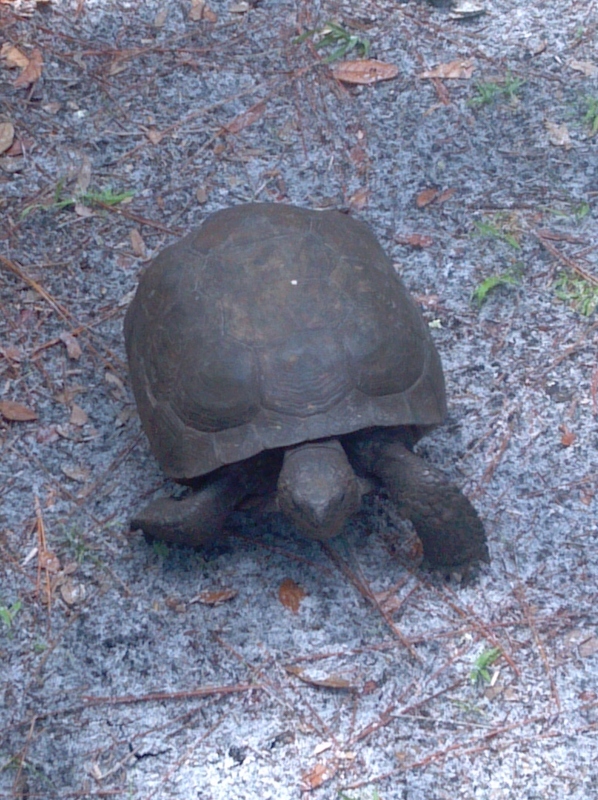 Sanibel Lighthouse and Corkscrew Swamp Sanctuary are addition hotspots not to be ignored in the coming days. 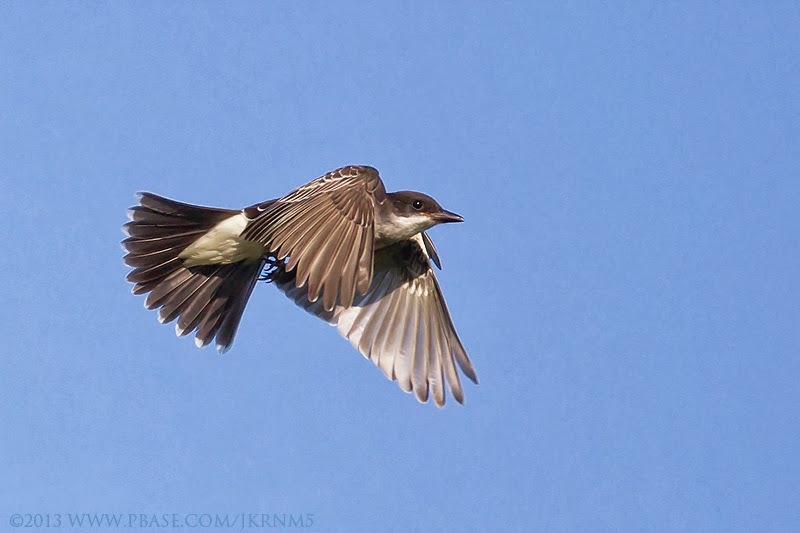 Eastern Kingbird photographed By Bob Pelkey at "the Annex"
Today I joined with Bob Pelkey - wildlife photographer and expedition leader - on a day trip across the state to visit birding hotspots in Miami-Dade County. It was a long, hot day starting for us about four-thirty in the morning. As we headed east, a goal of a one hundred count day was set and we soon had our first bird of the day with a Limpkin calling in the pre-dawn darkness as we passed through Collier County. Just a few days ago our friends Dr Padilla and Master Birder, Vince McGrath had made the same trip and had a very good experience at our first stop at "The Annex" on Aerojet Road within the Frog Pond WMA, which is just east of the entrance to Everglades National Park. Of special interest here besides migrating warblers were the reports of continuing alder flycatchers and a willow flycatcher. Bob and I arrived about seven-thirty and encountered a large crew of workers armed with machetes assembling at Lucky Hammock. 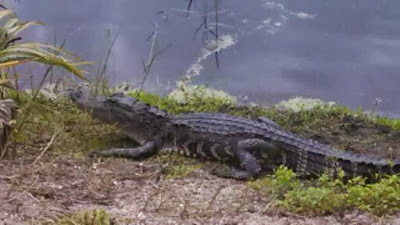 We learned that they were employed by the South Florida Water Management District to clear out exotic foliage, so moved on down the road toward The Annex for the flycatchers. But first we were stopped at the gate by an employee for SFWMD. We'd have to leave the car there and walk the site. 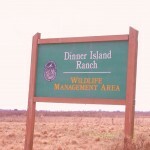 The location was being closed off due to folks using the remoteness to conduct non-wildlife viewing activities. We spent a couple of hours here and dipped on the flycatchers, In fact birding wasn't to exciting. Lots of Eastern Kingbirds were present, did get a female Black-throated Blue Warbler and a Northern Parula. A flock of migrating Bobolinks was observed passing overhead and White-eyed Vireos and Cardinals did call from the dense foliage. Only swallows recorded all day were seen here with seven Purple Martins perched on the wires and a lone Barn Swallow flying overhead. As we were leaving we added a Merlin, several Eastern Meadowlarks and Killdeer in the plowed fields. Added Common Myna in Florida City. From here we moved onto Matheson Hammock County Park in Coral Gables. We found very little activity in the picnic area or along the service road area. We did manage a nice male Black-throated Blue Warbler, Red-eyed Vireo, a Peregrine Falcon and a Yellow-throated Vireo (265). A lady riding her bike told us of a large flock of birds near the swimming beach, which turned out to be a large number of Wilson's Plover and Ruddy Turnstones, plus a lone Least Sandpiper. From here we checked out the nearby University of Miami Campus were we had good success with exotic birds last year, but with the campus busy with the purpose of education, we left for A.D. Barnes Park. Finally at Barnes, near the pool, we found some birds. Over the coarse of several hours we encountered American Redstarts, Tennessee Warblers, Ovenbirds, Northern Parula, Red-eyed Vireos, Acadian Flycatchers (266), Worm-eating Warbler, Black-and-White Warblers, a pair of White-crowned Pigeons, a Peregrine Falcon and a Common Hill Myna (267). At a stop at the Kendall Baptist Hospital campus Bob tried getting pics of the Mitred Parakeets in flight, but they were just too fast on the wing. Had to have been at least sixty parakeets on hand. At the pond we added a pair of Egyptian Geese, scores of feral Muscovy Ducks, Pekin Ducks and Graylag Geese. As we headed for home and enjoying urban traffic conditions we sighted several Monk Parakeets, a few White-winged Doves, Eurasian Collared Doves, Rock Pigeons and the usual city bird life. More Muscovy Ducks and another Egyptian goose. It was a good trip, but we come up short on our hundred count goal. Looking forward to seeing Bob's pics. Today, as I was taking the dogs out for a walk, a trio of Barn Swallows made an appearance above my home. These were the first Barn Swallows to visit us in some time and marked the end of the summer birding doldrums here in southwest Florida. I can also add several shorebirds - Piping Plover, Marbled Godwits, Least & Western Sandpipers and Spotted Sandpipers - as recent arrivals seen this morning at Bunche Beach. Barn Swallows were a common theme yesterday as I had been invited to return to Payne's Prairie by noted wildlife photographer Bob Pelkey. Barns were the only swallow species observed on the day with nesting birds seen under I-75 overpasses in Alachua County and dozens seen at Power Line Road. The day started at three in the morning with our departure from Ft Myers so that we could arrive at the La Chua Trail in Payne's Prairie Preserve when the gates were opened. Our arrival was greeted by lots of bird song and we had a nice mixed flock at the trail head. Here we started with Northern Bobwhite, White-eyed Vireo, Blue Gray Gnatcatcher, Red-bellied Woodpecker, Tufted Titmouse, Carolina Wrens, Carolina Chickadee, Black-and-White Warbler, Northern Parula, Osprey, American Crow, Black Vultures, Blue jays, Eastern Wood-Pewee (253) and Orchard Oriole. From here we entered the trail, with our target bird-of-the-day being the Mississippi Kites. t I had dipped on them my visit back on the 4th. After passing through the horse barn we entered the boardwalk, which curves around the Alachua Sink. Here we saw their herd of Spanish Horses with Cattle Egrets hitching rides on their backs. Bison and cracker cattle also roam the prairie. 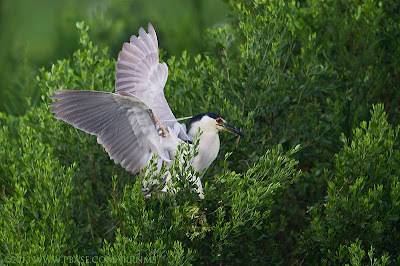 Several waders and large alligators were active and Black-crowned Night-herons and Green Herons were observed in flight. Checked the nearby snags for roosting kites, but just found more vultures, Great Blue Herons, Great Egrets and Anhingas in the trees. As we progressed along the trail we added Blue Grosbeaks (253), Eastern Towhee and Indigo Buntings. Near the observation tower we added a skulking King Rail (254) and Common Moorhens. The whooping cranes have not been reported here for over a month, probably because of rising water from our above-average rainfall, have relocated them. No sandhill cranes seen as well. By ten o'clock the day was heating up and we finally caught sight of the soaring birds we had been searching for. 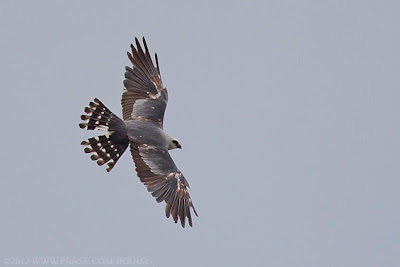 We had our Mississippi Kites (255) which put on a very nice show. 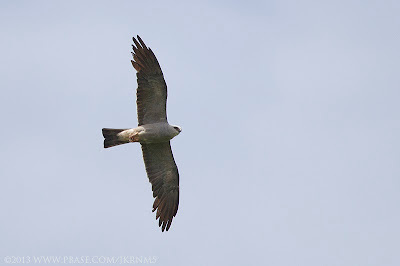 We actually had eight of them soaring overhead with a single Swallow-tailed Kite in their company. Also had a surprise here when a hummingbird zoomed past us as we watched the kites. Back at the trail head we relocated the mixed flock seen earlier. 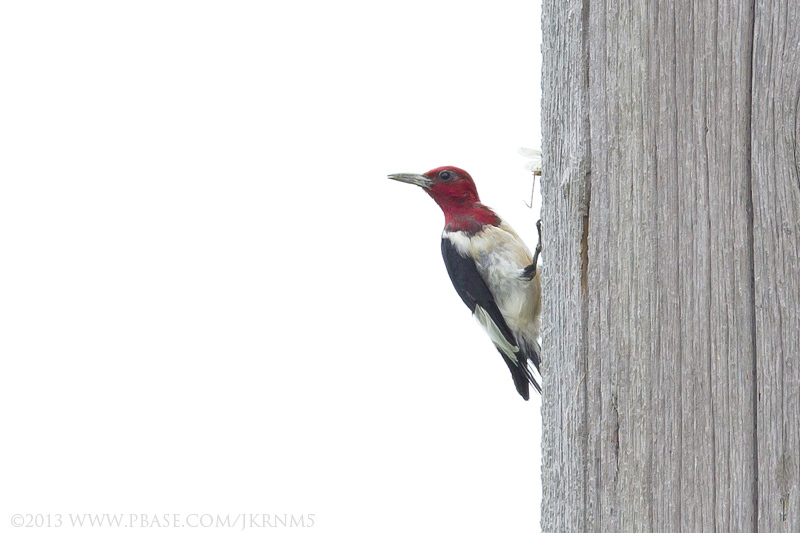 Here we added a posing Yellow-billed Cuckoo and Downy Woodpeckers to our list. Heading back toward home we added a stop at Power Line road near Brooksville. 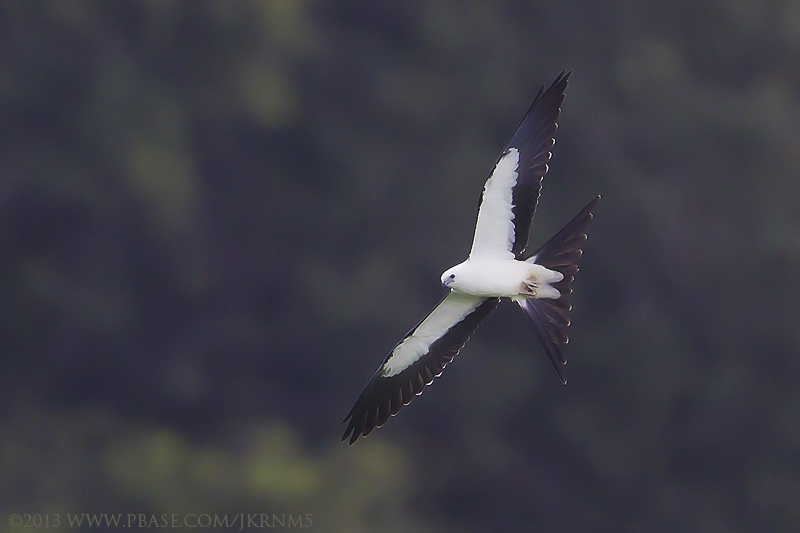 This location had been good for Mississippi and swallow-tailed kites, but the Mississippi kites have not been using the area lately. We did see several Swallow-tailed Kites including a family of four, which Bob was able to photograph an adult feeding a frog to a juvenile. We also had the Barn Swallows, Redheaded Woodpeckers, Eastern Meadowlarks, American Kestrels, Mourning Doves and a lone juvenile Brown-headed Cowbird. Lastly we stopped at Ft DeSoto in Tampa Bay to try to photograph the Brown Booby that has been observed here lately. Bob had tried for it a couple of days ago and had dipped on it then, just as we did today. we did see most of the expected shorebirds and waders, Some of these included Western, Least and Semipalmated Sandpipers, Marbled Godwits, Short-billed Dowitchers, Laughing Gulls, Willets, Ruddy Turnstones Cormorants, Brown Pelicans, Sanderlings, Sandwich Terns, Royal Terns, Foster's tern, Least Terns and a suspected common tern. We also added another juvenile Brown-headed Cowbird. On the way out of the park we made a stop at the Terra Verdi ponds were we saw the pair of Redhead ducks that has been summering here. Also lots of Magnificent Frigatebirds overhead, Fish Crows, Rock Pigeons, White Ibis, Cormorants, Laughing Gulls, and a pair of Nanday Parakeets. In all it was a hot, exhausting day with some very good results. Bob got some great shots and I got some good counts and we tally about 80 birds for the day. I haven't been to Bunche Beach for sometime, especially as so many of the birds have departed for there breeding grounds. 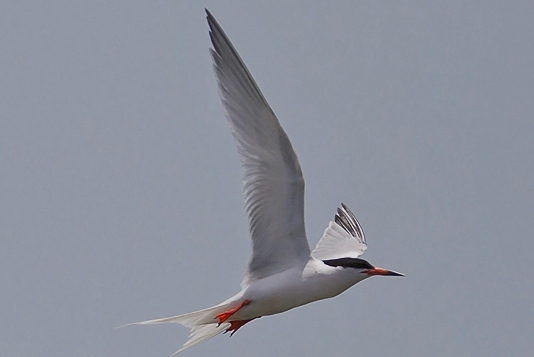 However, some of the species will have already returned south in July. Today I was lucky to find the Long-billed Curlew, assuming it is the same individually we have been seeing here for a some time, that has been a resident on this beach. 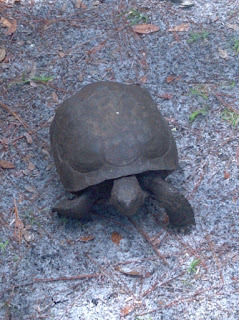 Bunche Beach and Ft Desoto Park in Tampa had been the most reliable locations for seeing this species in Florida. As I arrived a pair of Snowy Plovers were departing the area. Did not see too many species on this visit, but did find a Laughing Gull, a couple of Brown Pelicans and lots of Short-billed Dowitchers and Willets. Ospreys were hunting from overhead and Prairie Warblers were calling from the brush. From Bunche Beach I moved onto Bodwitch Point Park on Ft Myers Beach. Here a nesting colony of Least Terns has been roped off along with a couple of turtle nest sites. Again there was not a lot of variety. Brown Pelicans, Double-crested Cormorants and Laughing Gulls were occupying buoys and other features. Had a few Willets, Ruddy Turnstones, Wilson's Plovers and a lone Sanderling. Gray Kingbirds and Eurasian Doves sat on the wires outside of the park. So basically the Least Terns were dominate species here on my visit. I have set a birding goal of finding at least 300 species in Florida before the end of the year. To accomplish this goal, a birder in Florida will need to travel to various corners of the state. I had envisioned trekking up to the Tallahassee area in search for several species that nest in the panhandle, such as Kentucky and Hooded Warblers, Summer Tanagers, White-breasted Nuthatch, Mississippi Kite, Yellow-breasted Chat (one of my nemesis birds), Yellow-throated Vireo and Acadian Flycatcher. Was going to use the Fourth of July weekend for the overnight trip, but reality required a change in plans. Instead the trip was limited to a day trip up to the Gainesville area. Were many of the species are being reported. Was on the road by 5 AM and made my first stop for birds on a rural road near Plant City to check-out a pond on Bethlehem Road. My brief stop found a pair of Canada Geese, Chimney Swifts, Moorhens, White Ibis and a Sandhill Crane. 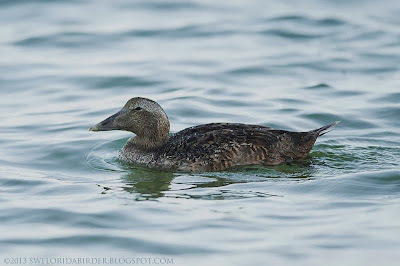 The Canadians were my 250th species for the year. Seems that it was a good start. By 10 am I reached the LA Chua Trail at Payne's Prairie Preserve south of Gainesville. Mississippi Kites are regularly seen here and recent reports of Blue Grosbeak, Yellow-breasted Chat and Whooping Crane were also targets for the day. But on my visit none of the above were located. I did add Carolina Chickadee, Indigo Buntings and Least Bitterns. By noon I had reached a new venue for me. 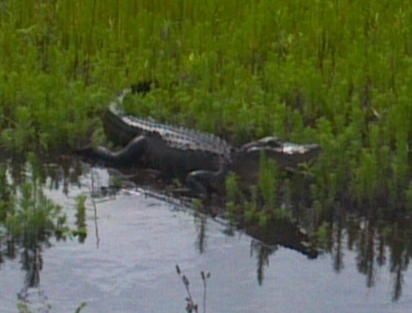 Gum Root Park in eastern Gainesville. Again, resent reports named Acadian Flycatchers, Yellow-throated Vireos and Summer Tanagers. And again I strike out on the target species. But I did add Whited and Red-eyed Vireos and a Pileated Woodpecker. Had a bit of time left before meeting family in Tampa for dinner so I made an added stop at Power Line Road, which borders Hernando and Pasco County. This is an excellent spot for Swallow-tailed and Mississippi Kites. Before reaching Power Line Road I came upon nesting Barn Swallows using an underpass under I-75 at Micanopy. So I explored Power Line Road for about an hour hoping to sight a Mississippi Kite, but again would dip on a targeted species. This proved to be the theme of the day. Did find, FOS for me, Eastern Kingbirds which were #251 for the year. Also added several American Kestrels. At time of the year the wintering Kestrels had returned north, except for a sub-species called Southeastern American Kestrels, which are Florida's resident kestrels. Other species seen here included several Swallow-tailed Kites, Red-shouldered Hawk, Red-tailed Hawk, Eastern Bluebirds, Red-headed Woodpeckers, Eastern Meadowlarks and Cattle Egrets. It was a long day, dipped on almost all of my targets, but I did find several good birds for this trip. I'll need to try again soon. Today, Bob Pelkey and I, participated in the pelagic trip sponsored by the Marine Science Center in Ponce Inlet, Florida. The event was lead by Michael Brothers, director of the Marine Science Center and is a fund raising function as well as a great opportunity to go out into the Atlantic after pelagic bird species we rarely see near land. Today's trip would take us across the Gulf Stream, to about 100 miles out, to the deep water canyons in an area they called the tuna grounds. 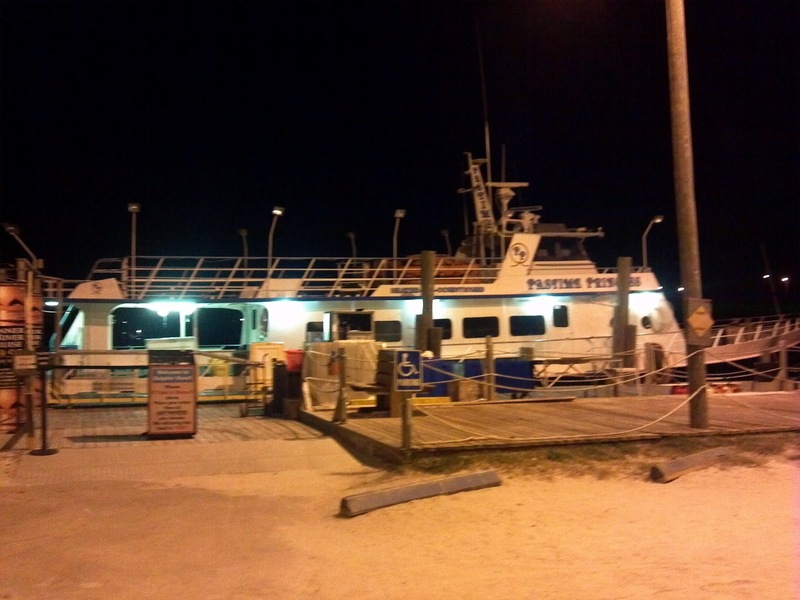 This was a long, long day with the boat, The Pastime Princess, leaving the dock at three in the morning. 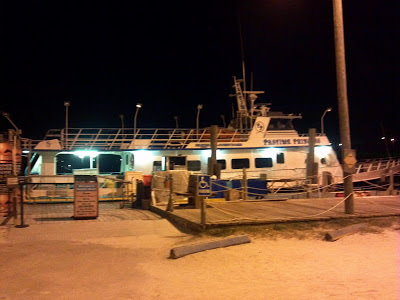 Bob and I left Ft Myers at eight o'clock and arrived at the dock by midnight. Extra travel time had been allotted to avoid any possibility of missing the departure. With this spare time, we attempted to grab a bit of sleep. It looked like we had forty-nine participants. Some folks I was familiar with, including Bob Hargrove from North Ft Myers., but most were not familiar faces. 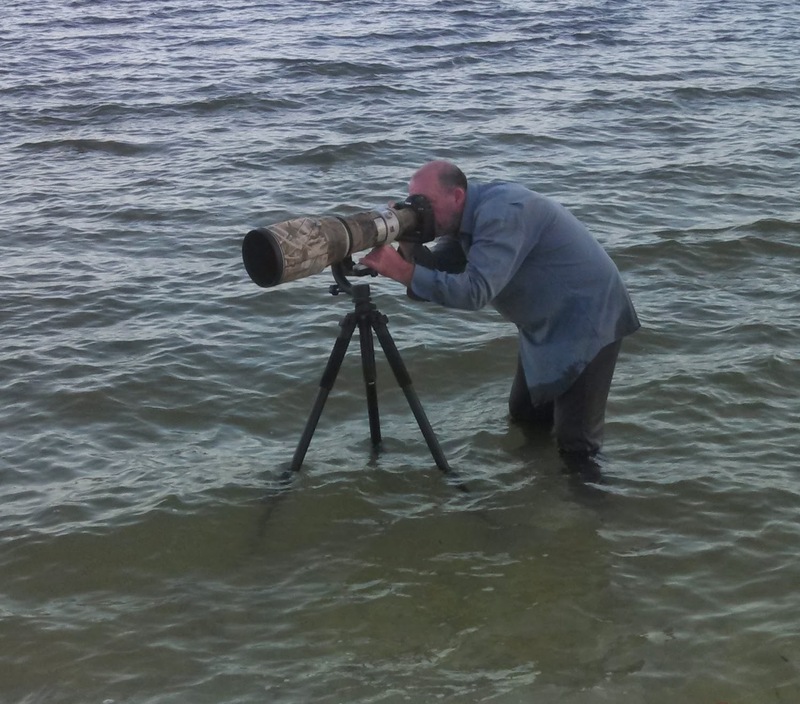 Like Bob's friend and fellow bird photographer Robert Doiron of New Brunswick, Canada. The first leg of our trip really was challenging. Three hours of rain as we headed east into the Atlantic. Ended up soaked to the skin as did Bob. Robert was lucky as he ended-up in a cozy spot in the cabin, which was already full before the rains started.. The misery would be abated hours later after clearing the weather, having our clothes dry off in the sun and passing a long bird-free stretch of ocean. We did have a few land birds check out the boat early-on in the darkness and rain. A small flock of Red-necked Phalorope - lifer approached twice as did a warbler, probably a blackpoll, and a thrush. In the following hours we had some nice contacts with some good birds. They were not numerous but a nice variety. 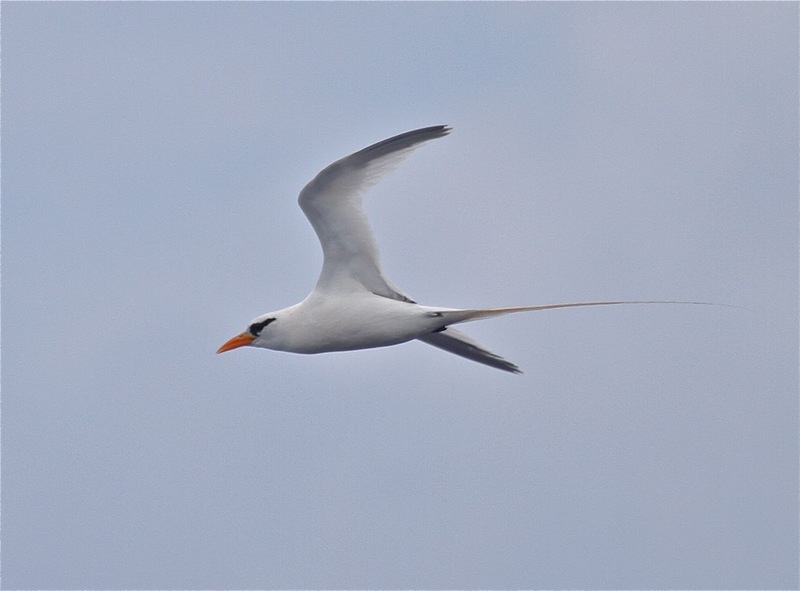 The star was a fly-by of an adult White-tailed Tropicbird. Lifer!! Other birds seen were Arctic Terns - Lifer, Sooty Terns, Bridled Terns, Audubon Shearwater - Lifer, a single Cory Shearwater, Wilson's Storm-Petrels - Lifer, several Black-capped Petrels, a Brown Booby and a Pomarine Jaeger. I see that other participants reported a sooty shearwater, red phalaropes, and leach's & band-rumped storm-petrels. We're checking Bob's photos to see if we captured these as well. Other sightings included the mates landing a wahoo and had earlier hooked and lost a blue marlin. A leatherback turtle was sighted but few of us actually saw it. We missed on any pelagic dolphins or whales, but one interesting sight was seeing a large ray breech and leap three times. Not sure what species it was. Maybe a manta or an eagle ray. Arrived at the dock just before 9 pm. Very tired and feeling the effects of bouncing on the waves for eighteen hours in the rain and sun. Would I do it again. Maybe next year. 49 stalwart adventurers joined us for a pelagic trip out of Ponce de Leon Inlet in Volusia County that started out at 3:00 a.m. in rain. 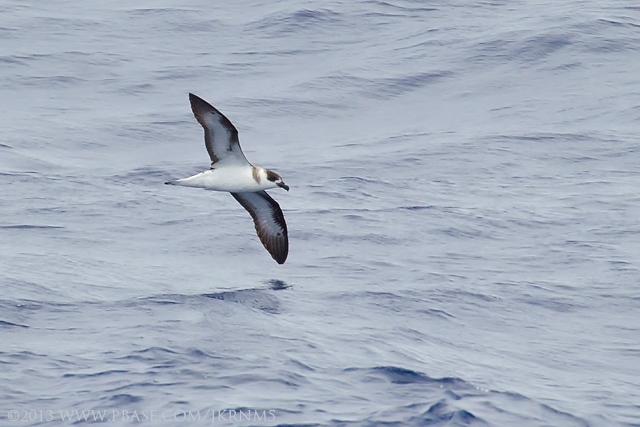 Eventually the rain left us and we began to find a great assortment of pelagic birds. At about 90 miles out, we began to find a lot of action, with Black-capped Petrel, Band-rumped Storm-Petrel, Arctic Tern, then the show-stopper of a fabulous adult White-tailed Tropicbird! The next trip will be in July. So far, weather conditions in Southwest Florida have been very favorable for migrants passing over Florida on their way north. Few had cause to visit our locale as the winds pushed them along. Last Spring we experienced some great birding as a weather front held the migrants here for several days. We have seen some migrants who stopped by, but their numbers were very thin. Some migrants seen by others included Blue Grosbeak, Cliff Swallow, Blue-winged Warbler, Hooded Warbler, Orchard Oriole, Scarlet Tanager, Summer Tanager, Eastern Kingbirds and a Gray-cheeked Thrush. 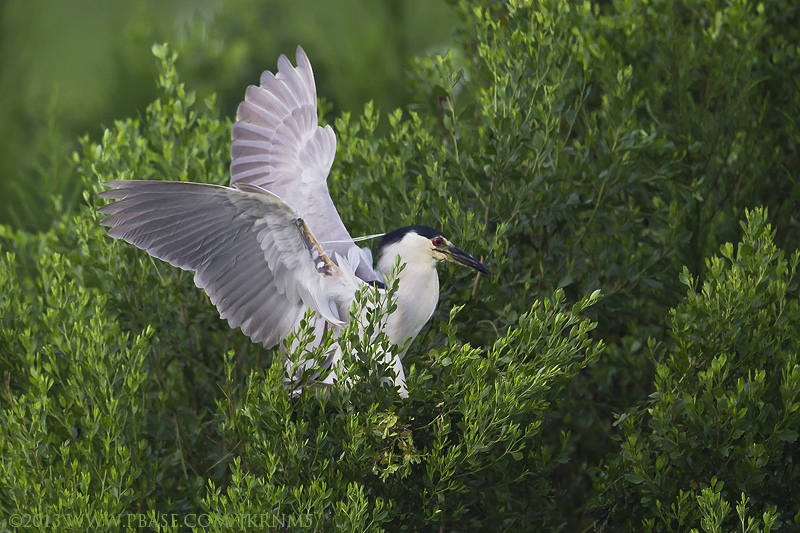 April is when Spring Migration kicks-in here in South Florida. We do experience some movement in March like with shore birds such as a few Pectoral Sandpipers. But April is the time to be checking any migrant traps. Weather plays a big part in what kind of activity we may experience. If the winds and weather are favorable for the birds they will fly past us and may come down in more northerly parts of the state. But sometimes weather conditions force them to down in our vicinity. Back around April 22nd last year we had such conditions and were able to enjoy a very nice variety of neotropic birds in our backyards. So today I checked out Ft DeSoto in Pinellas County to see if any stranglers remained. Bird sighting reports and weather conditions did not seem too favorable for me today, but logistics pretty much narrowed me down to this date. So off I went. Made a quick stop at The Celery Fields in Sarasota on the drive up. 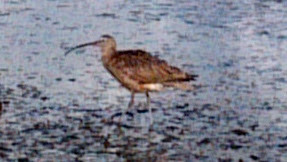 Here I was able to find several Limpkins and Cormorants. Also had Black-belled Whistling Ducks, a few late Blue-winged Teal, a Purple Gallinule, Common Gallinule, Swamp Sparrow, Savannah Sparrow, Rosette Spoonbill, Sora (heard), Marsh Wrens (heard) and Anhingas. At the Tierra Verdi Ponds north of Ft DeSoto Park the duck population has shrunk down to a lone Lesser Scaup, a lone Redhead and a pair of Red-breasted Mergansers. 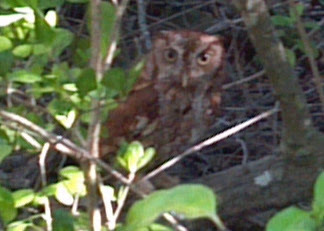 Spent five hour birding at Ft DeSoto Park. I wasn't alone as a large number of disappointed birders, many from out-of-state were busy trying to find birds. I personally only located three warblers. A Prothonotary at the mulberry trees in the company of a couple of Orchard Orioles, plus several Gray Catbirds and Starlings. My other warblers were a pair of Palm Warblers at the North Woods Picnic area. Just yesterday hooded warblers and tanagers were still here, but they had to have taken advantage of the strong southerly winds were we experiencing. A fresh wave of birds should move in this weekend because of a strong cold front moving in which should block their progress. Dead Shrike caught in a tangle of fishing line. was entertaining as it seemed to have some kind of issue with one particular godwit. Also had several Least Terns, Sandwich Terns, Royal Terns, Brown Pelicans, American Oystercatchers, Reddish Egrets included a white-morphed bird and Laughing Gulls in breeding colors. A trio of American Avocets in breeding colors was also observed near the entrance to the park. Counted twenty-two Nanday Parakeets in flight as well. Gave a little help to a ranger who was collecting a sick pelican at the fishing pier, He was talking the bird to be checked out. But sadly just after leaving the pier I noticed a dead Loggerhead Shrike hanging from a knot of fishing line I suspect they brought it in for a nearby nest. Another shrike, which I presumed was its mate was sitting very close by. Well after leaving the park I was not done yet. Headed over to Cockroach Bay Preserve hoping to find a gull-billed tern, eastern kingbird or a gray kingbird. Missed on them but find several Rosette Spoonbills, White, Glossy Ibis, Blue-winged Teal, Black-necked Stilts, Greater and Lesser Yellowlegs, a Solitary Sandpipers and Long-billed Dowithers (grapefruit backs). As my trip was wrapping up I made final stops in Cape Coral for the Florida Scrub Jays, Eastern Meadowlarks and Burrowing Owls at the Festival Park area and more Burrowing Owls and Monk Parakeets at the Pelican Boulevard baseball fields. A Cooper's Hawk was added too.